To Cite: Gray S, Olyaee Manesh A, Harirchi I, Nedjat S. Designing a Framework for “Iranian Pay for Performance” Program for Non-Medical Workforce in Hospitals, Health Scope. 2018 ; 7(S):e65472. doi: 10.5812/jhealthscope.65472. Background: Various pay for performance (PFP) models have been used for different purposes in many countries. The present study aimed to investigate the general framework and feasibility of the PFP program that was implemented in Iran (IR-PFP). Methods: In 2016, a document analysis was performed to achieve the original framework, and to evaluate its validity with the help of 2 expert panels, and both phases were managed using a four-stage Hermeneutic cycle. Results: The results of reviewing the documentation revealed that the framework required some prerequisites and determining the PFP of the department and individuals. The expert panels confirmed these 3 components, however, a fourth component namely determining the payment time was added to the model. In addition, the status of the key factors in the design and implementation of the program was reported. Conclusions: The model prerequisites proved helpful in considering the work diversity in hospitals. Furthermore, determining the PFP in 2 stages allowed the inclusion of more indicators in the structure of the program, however, it seems that determining the payment time in 3 months has not been practical for the Iranian health system. The framework has some instruments to strengthen teamwork and decentralize the human resources control and performance measurement in hospitals, however, hospital managers should always be careful about the unwanted side effects. Various methods, such as screening, socialization, and contract termination threats have been recommended to control the behaviors of employees in organizations (1). To resolve this issue, financial solutions have been proposed by economic theories (2, 3). Among the financial solutions employed by countries to improve the behavior of service delivery is the application of different payment structures, such as fee-for-service (4, 5), capitation, and pay for performance (PFP) (6, 7). The connection of financial incentives to people’s performance has come under the headings of pay for performance (PFP), performance-based payment (PBP), and performance-based financing (PBF) (8, 9). Countries like the United States, Turkey, the Republic of Korea, and the United Kingdom use different types of PFP models in health maintenance organizations (HMOs) for mobile physicians’ contracts, family physicians, in-home nursing care, and hospitals (10-12). Today, this kind of payment is known as one of the tools that support the health transformation plan (6). The ministry of health and medical education executed the Iranian pay for performance model in the public teaching hospitals in 2015 in line with the emphasis of the Iran’s laws to deploy the structures of the PFP program (13-15) and health transformation plan (16). The major goals of the program for the non-medical workforce were announced as follows: improving the team spirit, creating vitality, motivating employees, including all employees with any type of employment in the revenues of the hospital, increasing the organizational commitment, aligning the workforce’s motivation with the organizational goals, increasing the productivity of the employees of the hospital, improving the quality of services, improving the patients’ satisfaction, including the quantity and quality of the workforce’s performance in their salaries according to the type of activity, and increasing the motivation and commitment of the hospital management team towards the qualitative and quantitative growth of the health care services. According to these goals, the basis of designing this program was to resolve the problems of public hospitals across Iran (17). Since the program had several goals, its design was accompanied by a lot of complexity and details, and a wealth of documentation was collected for its development and implementation. Researchers -either participant or non-participant observers- consider the complexity of the program’s training to macro (universities) and micro (hospitals) level performers as one of the main issues during the implementation of the program. In addition, some universities postponed its implementation due to the complexity of the program. Therefore, the present study aimed to summarize the existing documentation, introduce the general framework of the program (the 2014 directive), and study its effectiveness to facilitate the understanding of the principles of the program as well as its training and initial critique of the program. As a result, the present study will provide a comprehensive view of the “Iranian Pay for Performance” program for the non-medical workforce in public hospitals. The present qualitative study was conducted at the national and provincial levels using document analysis (directives, reports, guidelines, letters, etc.) and expert panels in 2016. Document analysis, as a qualitative method, is a systematic method for evaluating electronic and printed documents. This method can be used for extracting meanings, understanding and developing empirical knowledge from documents. Documents such as minutes of meetings, program proposals, application forms, organizational or institutional reports, survey data, etc. can be used for this purpose. However, this method may not include items such as cultural artifacts and personal interpretations (18). Furthermore, the successful application of document analysis for technical issues (determining engineers’ needs to use information and documents) has existed for the provision of software (19). Therefore, according to the existing conditions and the lack of individuals who can fully describe the regular framework of Iranian PFP, this method was used to extract a framework for the new payment model. In the first step, documentation was scanned by the researchers for several times and the main components of the program were extracted (Table 1, Group 1). In addition, when there are classified and finalized documents (directive of PFP for non-medical workforce-2014), reviewing the past documents related to the subject is not necessary (18). However, the documents of pilot implementation of PFP in Mazandaran Province and Imam Hossein Hospital in Tehran (part of the final model of the country was taken from the model that the hospital had defined for itself) were taken into account to clarify some issues. One approach that is used for analyzing the text and documents is the hermeneutic method (20), which was used in the present study to study and manage the data. According to Gordian 1994, Hermeneutics is the science, art and philosophy of interpretation. According to this model, to interpret and understand a certain issue, the following stages are to be taken into consideration: interacting with a phenomenon based on the understanding of individuals from the subject and its history, the interpretations of the subject, as well as adopting new interpretations and combining them with the existing interpretations and deepening in the subject (21). The components of this cycle as well as the actions taken for each stage are shown in Table 2. A_ Interacting with a phenomenon based on one’s pre-understanding and history - Reviewing and summarizing the program documentation (Group 1, Table 1). Documents may be the only data needed for studies that use the Hermeneutic Interpretative Circle. However, it is recommended that the use of other methods along with document analysis can reduce the biases and some of the deficiencies in the analysis (18). Therefore, some additional ideas such as frequently asked questions (FAQ) from the program performers at university and hospital levels, minutes of meetings, official letters related to the subject (Table 1, Group 2), and 2 expert panels were added to the study method (Table 2). Finally, 2 expert panels were used at 2 stages. The experts (n = 5) were chosen in a way where they had enough knowledge about the program (at least 1 year of experience in the formulation and implementation of the program) (22). Furthermore, we invited 3 program designers (1 Master of Arts of MBA and 2 healthcare management experts), 2 PhD specialists knowing about the program (majoring in health policy) and researchers in each of the sessions. To evaluate the effectiveness of the dimensions of the program, a checklist, containing the suggestions of McPhie and Sapin (2006) on the components of the PFP models, was used and the status of these components was identified in the IR-PFP program. This checklist was designed to evaluate the PFP program by the USA federal government. Its goal was to reduce the waste of time, money, and work in designing and launching a PFP plan (23). The results of reviewing the documentation revealed that the framework required some prerequisites and determining the PFP of the department and individuals. The expert panels confirmed these 3 components, however, a fourth component, namely determining the payment time, was added to the model. In addition, the status of the key factors in the design and implementation of the program was reported. Pursuant to the directive, issued in 2014 (24), the general definition of the IR-PFP program for non-medical workforce was as follows: pay for performance (PFP) denotes the link between the employee’s discontinuous incomes and the revenues of their department in the form of a memorandum of understanding. 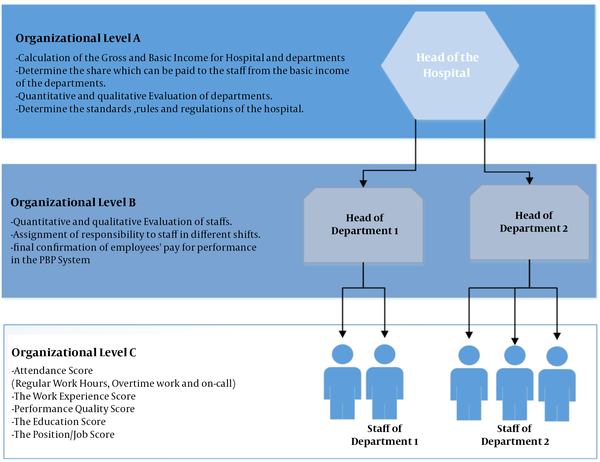 In this method, the calculations were made on 2 levels: firstly, the distributable incomes of the non-medical workforce employed in departments were calculated based on the performance of each department and secondly, each person’s share was determined based on the performance of each employee and their acquired points. Category 1. diagnostic and therapeutic departments: This category included the diagnostic, therapeutic or rehabilitation activities with approved tariffs, which were revenue generating activities (RGA’s), such as regular and special hospital beds, operating rooms, outpatient departments, para-clinics, paramedics and other licensed departments. These sections fell into 8 groups according to the severity of work (see supplementary file Appendix 1). For example, in the 1st group, there were clinics and outpatient departments for addiction with the lowest severity of work, and in the 8th group, there were emergency departments, ICU for pediatric cardiology, and ICU for implantation with the highest severity of work. Category 2. logistic department: this category included activities that were not related to diagnostic, therapeutic or rehabilitation with approved tariffs and were not revenue generating activities (RGA’s), such as departments of management, accounting, human resources and administrative affairs, information technology, nursing, medical equipment, infection control, accreditation, quality improvement, and other similar departments. The execution of the program was subject to the conclusion of the memorandum of understanding between the head of the hospital (first party) and the department directors (the second party) for 1 year. The memorandum was signed to determine the duties of the hospital and its department heads and to delegate the necessary authorities to the heads of departments. In this memorandum, the first party undertook the following tasks: calculation and declaration of the department base income (DBI) and the monthly department distributable income (25), declaration of the results of qualitative performance evaluations, insurance deductions and other issues in departments, setting a ceiling on work hours with regard to the needs of each department (Regular Work Hours, Overtime work and on-call), declaring the policy of human resources management in the hospital, considering the authority and autonomy of department managers in planning and decisions of the hospital, and presenting the university with the executive status of the program (see the main duties in Figure 1, Organizational Level A). The 2nd party undertook the following tasks: appropriate management of departments in accordance with the standards, rules and regulations of the hospital, improving the performance and quality of care in departments through correction of the related processes, provision of information on calculation of workforce ratings, final confirmation of employees’ PFP, workforce management, assignment of responsibility to workforce, quarterly employee performance assessment, training workforce about the PFP, and answering their questions in this respect (see the main duties in Figure 1, organizational level B). The PFP denotes the calculation of the monthly distributable department income (25). The summaries of separate calculations in diagnostic-therapeutic and logistic departments were presented in Table 3. Given the nature of activities in these 2 separate departments, the way these 2 types of payments were calculated was different. aIn each section, read the table vertically using the math symbols of -, ×, ÷ and =. bDuring the computation period, the calculated items remain fixed. cTo adapt the trend of calculations in 2 types of departments, this section of the table was left blank. Gross Income: To start the calculations, the gross revenues of diagnostic-therapeutic departments were first calculated separately in terms of revenue generation within a specified period (the professional and technical components of medical, therapeutic and diagnostic activities, hoteling, and selling medicine and medical supplies). Moreover, due to the lack of revenue generation in logistic departments, the hospital’s gross revenue was regarded as the base revenue in departments. The hospital’s gross revenue was the total of revenues recorded in patients’ medical records within a specified period. Basic Income: After calculating the gross income, the department basic income (DBI) was calculated. The revenues of the diagnostic-therapeutic department included all incomes recorded in patients’ medical records, except for the revenues from the sale of drugs, medical supplies, and insurance deductions in the department. To determine the logistic department’s basic income (LDsBI), the hospital’s basic income was multiplied by the shares of the logistic divisions in the logistic department’s percentage (LDsP). The basic income of the hospital included all incomes recorded in patients’ medical records, except for the revenues from the sale of drugs, medical supplies, and insurance deductions in the hospital. The logistic departments percentage (LDsP) was the result of the ratio of workforce overtime average (WOA) and workforce adjusted reward average (WARA) of the workforce employed in logistic departments to the monthly average of 1 year of the hospital basic income average (HBIA) in the past year (see Formula 1). It should be noted that this percentage was calculated at the time of signing the memorandum of understanding, and it will not change for a year. HBIA: The average of the hospital’s basic income. After calculating the basic income of diagnostic-therapeutic and logistic departments, the distributable income of each division was calculated. The distributable incomes of diagnostic-therapeutic departments were calculated monthly based on the DBIs of the divisions, the share which could be paid to the workforce from the basic income of the department and the department quality index (DQI) (see Formula 2). DQI: The department quality index. The distributable incomes of the logistic departments were calculated monthly based on the LDsBI, the workforce’s shares in the logistic department percentage (LDP), and the department quality index (DQI) (see Formula 2). DP was calculated based on the basic income using the following formula (see Formula 3). This share is derived from the ratio of workforce overtime average (WOA) and workforce adjusted reward average (WARA) to the department basic income average (DBIA) in the past months. The logistic department percentage (LDP) was calculated based on the shares of logistic departments using a formula similar to Formula 3. This share is the result of the total of workforce overtime average (WOA) and workforce adjusted reward average (WARA) of the workforce employed in logistic departments to the monthly average of one year of LDsBIA in the past months. The employees’ shares of the revenue from the DP and LDP Departments were calculated at the time of signing the memorandum of understanding, which will not change for a year. Moreover, the DQI of both departments was measured every 3 months using a standard evaluation form. Each form had several indexes based on the characteristics of each department, whose evaluators were different, depending on the indexes. In addition, the range of the score was between 0 and 550. The distributable income of each department was distributed according to the score of each employee in the division. To this end, the score of each person and the total score of all employees in the division were calculated. In addition, the monetary value of each score was determined through dividing the distributable income by the total sum of the points of the individuals. One’s performance–based income in a department was a multiple of the monetary value of the score of the division and the number of points of an individual in the same division. To determine the PFP of individuals, the calculation of the score of each person in each department is necessary. In Table 4, the set of scores shown (see the main factors in Figure 1, organizational level C). Attendance Score (a, a ‘, a”): The coefficient of attendance at regular work hours was 1 and 0.5 at on-call hours. As for the overtime work, the coefficient of attendance was between 2 and 4, depending on both departments and shifts, which was multiplied by the number of hours of attendance. The work experience score (b): for each year, a maximum of 2% was added to the obligatory and non-obligatory scores of individuals. In other words, there will be a maximum increase of 1 and 1.6 per hour for an employee with 1 and 30 years of work experience, respectively. The score of one’s performance quality (c): one’s score of performance quality was measured every 3 months using a standard evaluation form. Each form had several indexes based on the characteristics of each department, whose evaluators were different, depending on the indexes. Furthermore, the range of the score was between 0 and 110. The education score (d): education was divided into 8 categories; the lowest and highest scores were assigned to the ones holding below a diploma education, specialists, and fellowships, respectively. The position/job score (e, e’, e”): this score was based on occupation as well as education. Those with a greater responsibility in the department receive higher scores. A-diagnostic-therapeutic departments: the workforce of these departments received different scores (8 groups) according to the type of service. Emergency and operation room supervisors as well as head nurses had the highest scores, while custodians had the lowest scores (see supplementary file Appendix 2). B-logistic departments: the employees of these departments fell into 12 groups based on the type of activity. The head of the hospital and custodians had the highest and the lowest scores, respectively (see supplementary file Appendix 3). The total score (f, f’, f”): the sum of scores in each of the 3 attendance forms was calculated. The total score of an individual in a department (F): it is the sum of f, f’, and f”. The summary of all the above-mentioned steps for the diagnostic-therapeutic and logistic departments was shown in Table 3. Universities and colleges must plan in such a way that all the PFP stated in these directives be paid to physicians and non-medical workforce as soon as possible and within a maximum of 2 months (17). In a study conducted by McPhie and Sapin (23), 12 essential points were introduced to examine the effectiveness of compensation systems. In Table 5, these criteria were specified and discussed in the IR-PFP program. 1. Is the agency ready for pay for performance? 2. What are the goals of pay for performance? 3. Who should be paid for performance? 4. What should be the timing for implementing pay for performance? 5. What should be rewarded? 6. How should employees be rewarded? 7. How much pay should be contingent upon performance? 8. How should performance-based pay be funded? 9. How can costs be managed? 10. Who makes pay decisions? 11. Who provides input on the performance ratings? 12. How can agencies facilitate pay system integrity? The present study aimed to introduce the PFP in Iran. The dimensions of its effectiveness were investigated. The purpose of the IR-PFP program is to motivate the workforce using the financial incentives (8, 9), improving the service quality, creating a greater sense of justice, increasing the organizational and personal efficiency, and improving the employee retention through involving all managers and workforce (23, 26) in part of the hospital revenues. As suggested in other studies (27), this program can be used as a tool for addressing the issues related to service provision in public hospitals. This program can be considered a kind of "revenue sharing plan” (28), whereupon about 1/4 of the monetary value of the professional component of the relative value of the provided health services is granted to the hospital workforce in the form of forced distribution (23) and under the title of PFP along with wages (28-30). To strengthen the team activity at each level (23) the share of each department of the total payment is first determined in the program. This amount is then distributed among the employees of the department. It should be noted that none of the departments are compared with each other, however, each department is evaluated through comparing its current status with its past. A similar case can be seen in Janani Suraksha Yojana (JSY) programs in India (31). Therefore, if the performance score and the level of the efficiency of the department are reduced, the department and its workforce will be punished by reducing the amount of money received. This situation is observed in the hospital acquired conditions programs executed in hospitals based in Maryland and the Republic of Korea (12). To align the goals of departments (therapeutic and non-therapeutic teams) and the workforce with the goals of the hospital in accordance with the memorandum of understanding concluded between the hospital and department managers, the duty of administering the departments is assigned to the executive directors of departments (decentralization within the hospital), whose positive effects are an established fact (32). Accordingly, the hospital authorities will announce the expected results and the expected payment ceiling, while the executive directors will be responsible for the management of the human resources and the performance of departments. Basically, any activity that is measured will also affect the direction of activities (12). In the said program, the scoring indexes of the departments and employees are determined based on their type of activity. These indexes are a set of factors affecting the delivery of services, including facilities, equipment, resources, medicine, information technology, and human resources. More to the point, these indexes are evaluated in several ways (12). It should be noted that middle and upstream managers, employees of the same position and subordinates are among these evaluators. To better understand the relationship between performance and pay for performance, assessments of the departments and workforce are carried out at short intervals (every 3 months) along with taking the indexes of evaluation into account. It should be noted that, given the geographical extent of Iran and the status of different hospitals (items outside the control of individuals and departments affecting the pay for performance), it is always possible to make some alterations to the IR-PFP Directives in hospitals though explaining the causes and approval at the upstream levels (12). Although, quality improvement is officially announced in the program documentation and its indicators are well defined, the position given to the quality within the framework is after the income generation. In other words, the first goal of the program is to increase the productivity of hospitals and to increase the employees’ income. This is while quality improvement is the first goal reported for the VIP program in Korea and IHA in California. Therefore, quality indicators for services are being measured in hospitals (33, 34). Since low and medium pay rates are not able to give employees more motivation (35), PFP plans require a large amount of money (36). In Iran, the average PFP was about 28% of the professional component of the services produced by the hospital doctors. These financial resources have been anticipated through the reforms of the professional component of health services in the book "Relative Value of Health Services” (16). Hospitals do not need financial resources outside the organization to provide it (23). In terms of the calculation of the workforce’s scores, the total technical approach of the program was arranged in such a way that the occupational and personal variations in the hospital (23) and the shortages of hospital staffs in Iran (17) were seen.In addition, in this model, the value of each score in 1 section was the same for the employees of that section; however, it was not the same for different sections. This makes it possible for hospital managers to easily relocate their employees among different departments (even during a month). A person’s final income is made up of the individual’s income from 1 or more sections in that month. The biggest problem of the program (1st edition) is the retroactive use of data. This calculation method leads to the transfer of defects in the former payment system and other executive issues to this new program. Many concerns were expressed by the panel members and studies (36) about the need for financial sustainability of PFP initiatives. This has been reflected in postponement of employees’ payments in other countries (37), which could influence all of the program’s effects. The Iran’s program was implemented simultaneously for all public hospitals. However, the Korean VIP program was initially implemented in 2 specific sections (heart and cesarean section) and only in teaching hospitals. At this point, some specific privileges were also given to some of the referral hospitals. In 2011, with a positive assessment of the effects of the program, the program was expanded to other hospitals in the country (33). In addition, the long-term implementation of the program may also result in unwanted consequences. According to some studies, such consequences include the neglect of other important tasks, changes in the reports rather than in activities, the expansion of the resource gap between hospitals with low and high financial resources, the dependence of individuals on financial incentives, fading out of internal motivation (36), and nepotism related issues (37). Moreover, the prevention of such administrative barriers will be necessary through continuous evaluation and timely feedback to hospitals. The results of IHA PFP showed that in addition to the amount and type of payment to employees, the next important thing was the inner motivators (reward and public reporting). According to the documents which were reviewed, this issue has not been considered in the Iranian program (34). Each of the dimensions of the IR-PFP program was included to improve the specific issues in public hospitals. The model prerequisites proved helpful in considering the work diversity in hospitals. In addition, determining the amount of payment in 2 stages allowed the inclusion of more indicators in the structure of the program. The required funds for making payments were supplied by the hospital’s internal revenues, however, it seems that determining the payment time in 3 months has not been practical for the Iranian health system. Therefore, there are concerns about the program’s financial sustainability. The framework has some instruments to strengthen teamwork and to decentralize the human resources control and performance measurement in the hospitals. However, hospital managers should always be careful about the unwanted side effects. Due to the control of the entire article, the researchers had no choice but to refrain from expressing many details of the model and only the main framework was introduced. Authors’ Contribution: Serajaddin Gray and Alireza Olyaee Manesh developed the original idea, abstracted and analyzed data, as well as wrote the manuscript. Iraj Harirchi contributed to interpret of the Model. Saharnaz Nedjat developed analyzed data. Conflict of Interest: The authors Serajaddin Gray and Saharnaz Nedjat have no conflict of interest in this article. Despite the fact that Alireza Olyaee Manesh and Iraj Harirchi are involved in organizational positions related to the program at the ministry of health and medical education, they express that their opinions in this article are completely scientific and impartial, and there are no conflicts of interest. 1. Robinson JC. Theory and practice in the design of physician payment incentives. Milbank Q. 2001;79(2):149-77. 2. Kane RL, Johnson PE, Town RJ, Butler M. A structured review of the effect of economic incentives on consumers' preventive behavior. Am J Prev Med. 2004;27(4):327-52. doi: 10.1016/j.amepre.2004.07.002. [PubMed: 15488364]. 3. Gneezy U, Meier S, Rey-Biel P. When and Why Incentives (Don't) Work to Modify Behavior. J Econ Perspect. 2011;25(4):191-210. doi: 10.1257/jep.25.4.191. 4. Eijkenaar F, Emmert M, Scheppach M, Schöffski O. Effects of pay for performance in health care: a systematic review of systematic reviews. Health Policy. 2013;110(2):115-30. doi: 10.1257/jep.25.4.191. 5. Musgrove P. Financial and other rewards for good performance or results: a guided tour of concepts and terms and a short glossary. Washington, DC: World Bank; 2011. 6. Van Herck P, De Smedt D, Annemans L, Remmen R, Rosenthal MB, Sermeus W. Systematic review: Effects, design choices, and context of pay-for-performance in health care. BMC Health Serv Res. 2010;10:247. doi: 10.1186/1472-6963-10-247. [PubMed: 20731816]. 7. Bremer RW, Scholle SH, Keyser D, Houtsinger JV, Pincus HA. Pay for performance in behavioral health. Psychiatr Serv. 2008;59(12):1419-29. doi: 10.1176/appi.ps.59.12.1419. [PubMed: 19033169]. 8. Jha AK, Joynt KE, Orav EJ, Epstein AM. The long-term effect of premier pay for performance on patient outcomes. N Engl J Med. 2012;366(17):1606-15. doi: 10.1056/NEJMsa1112351. [PubMed: 22455751]. 9. Grittner AM. Results-based financing: evidence from performance-based financing in the health sector. 2013. 10. Mehrotra A, Sorbero ME, Damberg CL. Using the lessons of behavioral economics to design more effective pay-for-performance programs. Am J Manag Care. 2010;16(7):497-503. [PubMed: 20645665]. 11. Doran T, Fullwood C, Gravelle H, Reeves D, Kontopantelis E, Hiroeh U, et al. Pay-for-performance programs in family practices in the United Kingdom. N Engl J Med. 2006;355(4):375-84. doi: 10.1056/NEJMsa055505. [PubMed: 16870916]. 12. Paying for Performance in Health Care Implications for Health System Performance and Accountability: Implications for Health System Performance and Accountability. OECD Publishing; 2014.World Health Organization. 13. Rc.majlis. The fifth development plan act. paragraph M. 2010. Available from: http://rc.majlis.ir/fa/law/print_version/790196. 14. Rc.majlis. The fourth development plan act. article 143, paragraph F. 2004. Available from: http://rc.majlis.ir/fa/law/show/94202. 15. Rc.majlis. The state service management act. article 38. 2007. Available from: http://rc.majlis.ir/fa/law/print_version/130021. 16. Moradi-Lakeh M, Vosoogh-Moghaddam A. Health Sector Evolution Plan in Iran; Equity and Sustainability Concerns. Int J Health Policy Manag. 2015;4(10):637-40. doi: 10.15171/ijhpm.2015.160. [PubMed: 26673172]. 17. Letter of the Ministry of Health and Medical Education. No. 1525/100. 2015.Ministry of Health and Medical Education. 18. Bowen GA. Document Analysis as a Qualitative Research Method. Qual Res J. 2009;9(2):27-40. doi: 10.3316/qrj0902027. 19. Wild PJ, McMahon C, Darlington M, Liu S, Culley S. A diary study of information needs and document usage in the engineering domain. Design Stud. 2010;31(1):46-73. doi: 10.1016/j.destud.2009.06.002. 20. Debesay J, Naden D, Slettebo A. How do we close the hermeneutic circle? A Gadamerian approach to justification in interpretation in qualitative studies. Nurs Inq. 2008;15(1):57-66. doi: 10.1111/j.1440-1800.2008.00390.x. [PubMed: 18271791]. 21. Chang J. Hermeneutic Inquiry: A Research Approach for Postmodern Therapists. J System Ther. 2010;29(1):19-32. doi: 10.1521/jsyt.2010.29.1.19. 22. Davis LL. Instrument review: Getting the most from a panel of experts. Appl Nurs Res. 1992;5(4):194-7. doi: 10.1016/s0897-1897(05)80008-4. 23. McPhie N, Sapin BJ. Designing an Effective Pay for Performance Compensation System. US Merit Systems Protection Boar, 1; 2006. 24. Directive of pay for Performance for Non-medical workforce of hospitals affiliated to university/Faculty of Medical Sciences and Health Services. Tehran: Therapeutic Deputy; 2014.Ministry of Health and Medical Education. 25. Tabibi SJ, Najafi B, Shoaie S. Waiting time in the emergency department in selected hospitals of Iran University of Medical Sciences in 2007. Pejouhesh dar Pezeshki. 2009;33(2). 26. Marsden D. Performance related pay for government employees: an overview of OECD countries. OECD; 2005. 27. Boxall AM. Should we expand the use of pay-for-performance in health care?. Parliamentary Library; 2009. 28. Hambly K, Kumar RV, Harcourt M, Lam H, Wood G. Profit-sharing as an incentive. Int J Human Resource Manag. 2017:1-21. doi: 10.1080/09585192.2017.1334149. 29. Coates III EM. Profit sharing today: plans and provisions. Mon Lab Rev. 1991;114:19. 30. Kato T, Morishima M. The nature, scope and effects of profit sharing in Japan: evidence from new survey data. Int J Human Resource Manag. 2003;14(6):942-55. doi: 10.1080/0958519032000106155. 31. Uttekar BP, Barge S, Khan W, Deshpande Y, Uttekar V, Sharma J, et al. Assessment of ASHA and Janani Suraksha Yojana in Rajasthan. Vadodara Gujarat Centre Operat Res Train. 2007. 32. Harding A, Preker AS. Understanding organizational reforms. Washington: The World Bank; 2000. 33. Kim SM, Jang WM, Ahn HA, Park HJ, Ahn HS. Korean National Health Insurance value incentive program: achievements and future directions. J Prev Med Public Health. 2012;45(3):148-55. doi: 10.3961/jpmph.2012.45.3.148. [PubMed: 22712041]. 34. Association IH. 1115 Waiver Renewal Plan-Provider Incentives, Expert Stakeholder Workgroup. Sacramento, California; 2014. Available from: http://www.dhcs.ca.gov/provgovpart/Documents/Waiver%20Renewal/MCO1_IHA_ADA.pdf. 35. Greene J. An examination of pay-for-performance in general practice in Australia. Health Serv Res. 2013;48(4):1415-32. doi: 10.1111/1475-6773.12033. [PubMed: 23350933]. 36. Oxman AD, Fretheim A. Can paying for results help to achieve the Millennium Development Goals? Overview of the effectiveness of results-based financing. J Evid Based Med. 2009;2(2):70-83. doi: 10.1111/j.1756-5391.2009.01020.x. [PubMed: 21348993]. 37. Oxman AD, Fretheim A. Can paying for results help to achieve the Millennium Development Goals? A critical review of selected evaluations of results-based financing. J Evid Based Med. 2009;2(3):184-95. doi: 10.1111/j.1756-5391.2009.01024.x. [PubMed: 21349012].